Linear ssRNA(+) genome of 7.5-8.5 kb, polyadenylated, composed of a single ORF encoding a polyprotein. Viral genomic RNA has a viral protein (VPg) at its 5'. The long UTR at the 5' end contains an internal ribosome entry site (IRES) type II. The P1 region encodes the structural polypeptides. 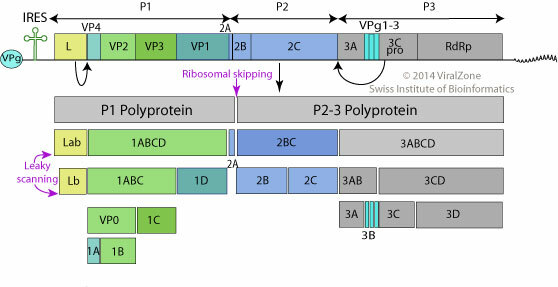 The P2 and P3 regions encode the nonstructural proteins associated with replication. Encodes a N-terminal leader protease (L protease) in addition to the 3C protease. The shorter 3' UTR is important in (-)strand synthesis. Attachement of the virus to host receptors mediates endocytosis of the virus into the host cell by clathrin-dependent endocytosis. TROPISM Primary site of infection: epithelial cells of the soft palate and pharynx, followed by the lung. Secondary site of infection: epithelial cells of the feet and mouth. GEOGRAPHY Worldwide. Endemic in parts of Asia, Africa, the Middle East and South America. ASSOCIATED DISEASES Foot-and-mouth disease (fever, blisters on mouth and feet). TRANSMISSION Direct or indirect contact, saliva. Airborne. VACCINE Foot and mouth disease virus (immunity is virus type-specific). Foot-and-mouth disease virus leader protein inhibits the host IFN-mediated response by inhibiting IRF-3 . FMDV inhibits host translation by cleaving eIF3a, eIF3b, and PABP .